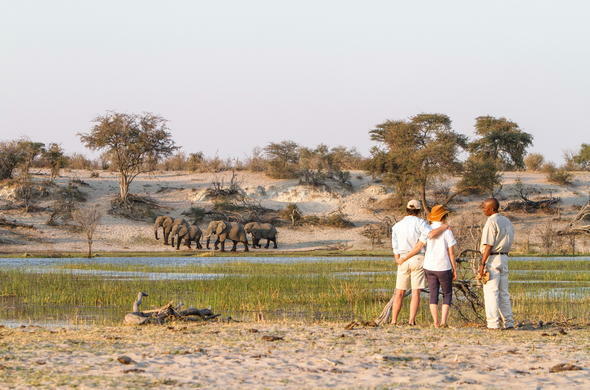 On this 5 day Classic Fly-in Makgadikgadi Pans & Okavango Safari for Couples, experience the diversity of the Kalahari Desert in Botswana where desert and delta combine to provide an experience of amazing discoveries. 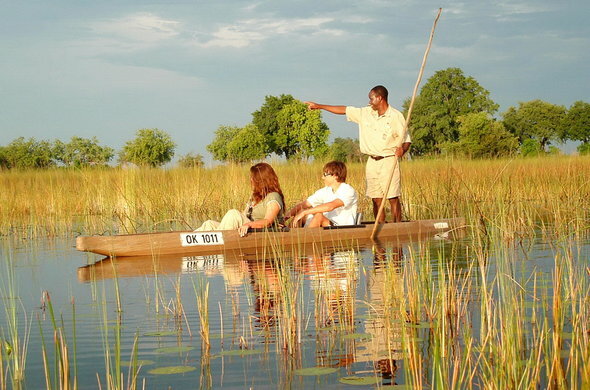 The Makgadikgadi Pans and Okavango Delta could be safaris on their own but this Desert to Delta Safari Package combines these 2 areas into one, to ensure a fascinating Botswana holiday that will live long in the memory. 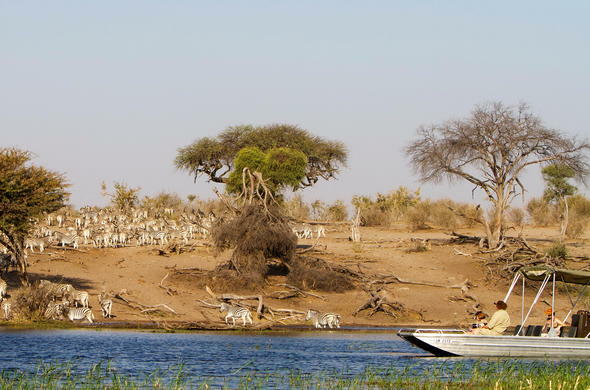 The Okavango and Makgadikgadi are both remnants of the same ancient inland lake that covered much of the area before geological factors changed the course of rivers that flowed into the lake, and what emerged are 2 very special wilderness areas. Knowledgeable guides will share their passion for the areas with you on game drives, walks, boat cruises and mokoros. There may be an opportunity for a visit to a local village to gain an understanding of daily life in Botswana. You will arrive in Maun from Johannesburg before boarding a light aircraft for the flight to your camp in the Makgadikgadi area of Central Botswana. Situated on the now flowing Boteti River which is the boundary of the Makgadikgadi Pans National Park, the safari lodge is perfectly located on a private concession. The wildlife is prolific and there may be an opportunity of experiencing the Zebra migrations. An early morning wake-up call with a light breakfast signals the start of a fascinating day exploring the area on game drives and walks. The guides will share their knowledge of the area with you and there may be an option of visiting a village in the area to learn about the daily lives of the people in Botswana. Situated on the boundary of the Makgadikgadi Pans National Park, the lodge is the perfect springboard for drives into the park. The camp is on a private concession which affords the opportunity for night drives to see some of the elusive nocturnal creatures on show. Kalahari nights are truly special and the stars seem to be brighter here than anywhere else on earth. There will be time for an early activity before boarding a light aircraft flight north into the Okavango Delta where you will spend 2 nights marvelling at the wonders of this unique wilderness. The Okavango Delta is the world's largest inland lake and the safari lodge is considered to be one of the most beautiful in the Delta. Knowledgeable guides will share their passion for the area with you during your stay. 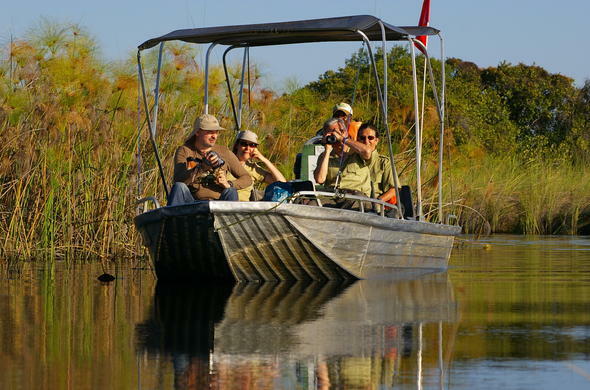 Sunrise signals a day of intrigue and wonder exploring the channels and floodplains of the Okavango on boat cruises, mokoros and nature walks. As the safari lodge is in the permanent Delta, water activities take precedence as you marvel at the diversity of life and the intricacies of this incredible ecosystem. 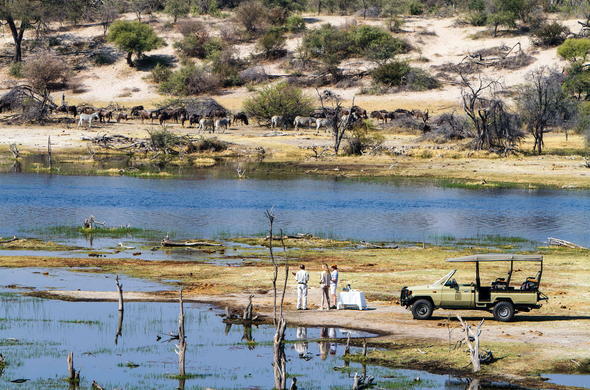 Here is a pristine wilderness that has formed where the waters of the Okavango River sink away into the sands of the Kalahari Desert, forming one of the unheralded wonders of the natural world. Listening to the sounds of the Delta night is an experience in itself and no better soundtrack to drift off to sleep to. Make the most of your last day in the Delta. There will be time to experience more of this fascinating wilderness before breakfast. You will be transferred to Maun to catch your flight back to Johannesburg after a memorable couple holiday package in the Kalahari. 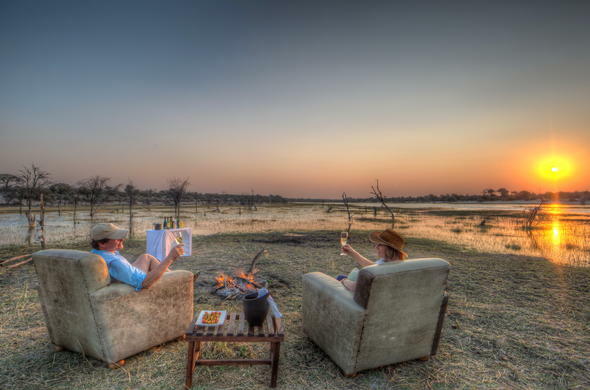 This Classic Makgadikgadi Pans & Okavango Package for Couples is based on a 5 day fly-in safari with rates per person sharing a room, all inclusive of meals and scheduled activities with flights ex/to Johannesburg O.R. Tambo Airport. This Botswana package is not available from the beginning of January to the beginning of February during the rainy season. Please ask our consultants for an alternative option at this time.